MADRID - Spain braced for mass street protests Saturday as anger swelled against Catalan leaders' vows to declare their region independent and the national government's handling of the volatile political crisis. Tentative signs have emerged that the sides may be seeking to defuse the crisis after Madrid offered a first apology Friday to Catalans injured by police in a crackdown on their outlawed independence vote on October 1. But uncertainty still haunted the country as Catalan leaders have not backed off from plans to make a unilateral declaration of independence within days, based on the result of the banned referendum vote. "There has to be a commitment to dialogue," said Jordi Cuixart, president of one of the grassroots groups driving Catalonia's separatist movement, on Catalan radio on Saturday. "We will never refuse that. But we... will continue to demand a commitment that the referendum law be fulfilled." Spanish Prime Minister Mariano Rajoy has vowed to block independence as well as any referendum. And he has rejected calls for mediation in a dispute that has drawn cries of concern all over Spain, and even from Barcelona and Real Madrid footballers. 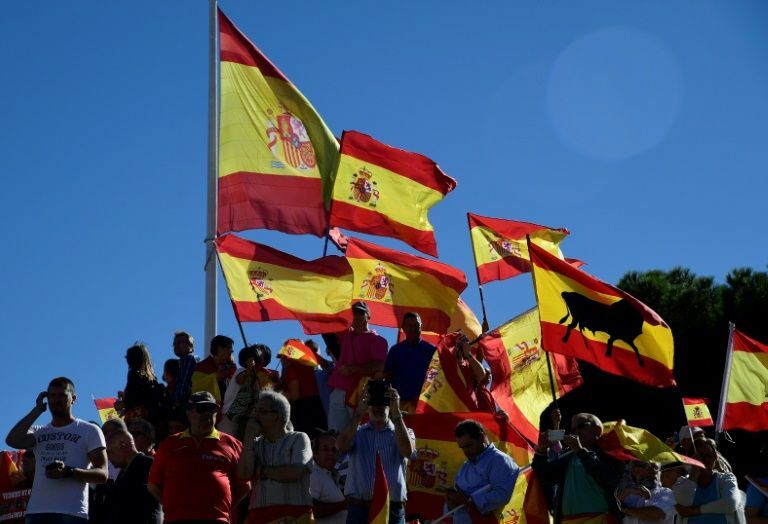 Spain's deepest political crisis in decades has raised fears of further unrest in the northeastern region, a tourist-friendly area of 7.5 million people that accounts for a fifth of Spain's economy. Opponents of secession called for demonstrations around Spain on Saturday and a major rally in Barcelona on Sunday. A movement called "Let's Talk" urged citizens to gather dressed in white in front of town halls across the country, demanding dialogue to end the crisis under the slogan: "Spain is better than its leaders". "It's time to come together to tell them that they are incapable and irresponsible," the group's manifesto reads. The gatherings will start from around midday (1000 GMT). A separate "patriotic" march was called for the same time in central Madrid, organised by activists defending the unity of Spain. Friday saw the first signs the sides may be willing to step back from the brink in a political conflict that risks destabilising Europe. After days of ill-tempered rhetoric, the central government said it regretted the injuries and suggested Catalonia should hold a regional election to settle the crisis. Catalan government minister Santi Vila, a close of ally of regional president Carles Puigdemont, meanwhile told broadcaster Rac1 that his side could consider a "ceasefire" in the dispute, to avoid a further crackdown by Madrid. Businesses and the government have kept up economic pressure on Catalonia however, with several big companies announcing moves to shift their headquarters to other parts of Spain. Puigdemont had been due to appear at the regional parliament on Monday but postponed it by a day, a spokesman said, gaining time and easing tensions. It remains unclear what he plans to say, although some leaders are hoping he will use the opportunity to make a declaration of independence. Spain's central government apologised on behalf of police to people hurt in Sunday's referendum disturbances. "I can do nothing but regret it, apologise on behalf of the officers who intervened," said the government's representative in Catalonia, Enric Millo. Central government spokesman Ignacio Mendez de Vigo also said he "regretted" the injuries. "It would be good to start mending this fracture... through regional elections," he told a news conference. In Madrid meanwhile, Catalonia's police chief and two prominent separatist leaders including Cuixart avoided being remanded in custody at a court hearing Friday over sedition accusations. Spain's Constitutional Court on Thursday ordered the suspension of a session scheduled for Monday in the Catalan parliament at which some leaders have called for an independence declaration. If Catalonia declares independence, Spain could respond by suspending the region's existing autonomous status and imposing direct rule from Madrid. On another front, the government in Madrid pushed ahead with a measure to pressure Catalonia economically. It passed a decree to make it quicker for businesses to shift their legal domiciles away from one region to another. With its own language and cultural traditions, demands for independence in Catalonia date back centuries but have surged during recent years of economic crisis. The Catalan government on Friday published final results from the referendum indicating that 90 percent of voters backed the idea of breaking away from Spain. Recent polls had indicated that Catalans are split on independence, though leaders said the violence during the referendum turned many against the state authorities. Spain braced for mass street protests Saturday as anger swelled against Catalan leaders' vows to declare their region independent and the national government's handling of the volatile political crisis.